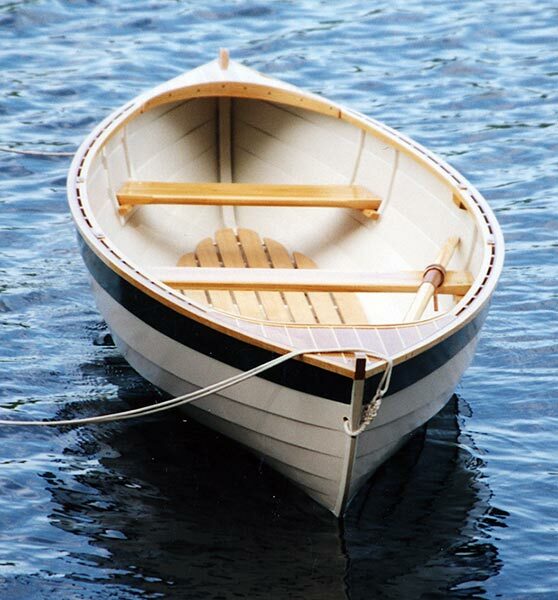 Jim Hammond built this 15'6" double-ended rowing skiff from a mold found in the shop of the late Harold "Bones" Bulmer of Ontario, Canada. Jim calls this the first 'modern' version of a boat built by Mason Boatworks in St. Williams and Port Rowan, Ontario, Canada. He used the glued lapstrake style of construction described by John Brooks in WB issues 156-158. He writes that "she is very fast to row with 8 -+' homemade oars, and will soon rig her for sail and an inboard electric motor." Contact Jim at Inner Bay Boats 27 East -+ line Road, St. Williams, Ontario, Canada N0E 1P0. www.innerbayboats.com or jfhammond@kwic.com.